Discussion in 'Nebraska Flyway Forum' started by nebgoosehunter, Aug 1, 2018. Sound like fun to me nebgoosehunter a friend and I put out 800 fb yesterday in flooded eastern NE in 8"of mud my back and legs are killing me hope we get a shot at them before they all go by! In the morning there was a ton of them around but by noon they were gone. Got out for my first hunt in the decoys yesterday afternoon with my two boys. I can honestly say my 5 year old was a big help and knew where and how to put the decoys. I didn't even have to tell him. Needless to say it didn't take long to put out with just two of us. Birds flew real late, but saw a ton, we were just in the wrong flight line coming off the roost. Finally had some birds spreading out and had a pair of ross come from way up right to the boot bags and I only shot one, couldn't believe it. Had a couple more decent flocks give me a look right before sunset but they kept going. Had a flock of six come in right at sunset only to hang up right over me, they seemed like they were plenty kill-able at 50 yards, but I couldn't even scratch one out of them. A big feed got up to my west a few miles probably 15 minutes after sunset and the whole flock tornadoed down on me. In the dark like that I think they seem closer than they actually are. After two real good swings the whole flock seemed like they were just hovering over me at 40 yards and weren't going to make another pass so I cut into them and not a bird fell. I was beside myself, especially trying to get another bird for my oldest who is just plain obsessed. Looking back at the GoPro video they weren't hovering as much as I thought and were probably closer to 60 instead of 40 but it was just hard to tell in the dark and in the chaos of so many birds right above me and being so loud. Still should have been able to get one, but my shooting yesterday just plain stunk. 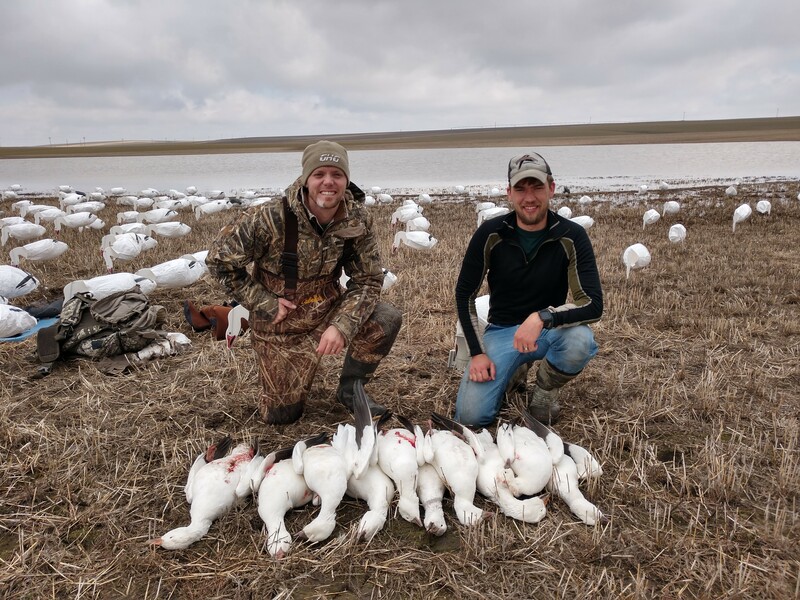 It was still a fun hunt though, I decoyed snow geese so it was a success! Sounds like a replay of me a week ago! Found a good group of unpressured snows on Friday but with the rain forecast we decided not to hunt them yesterday. Went and sat in a blind on the pasture pond I hunt as the landowner said some snows were around the day before. It was an utter failure and we only saw two snows and it was when we were all standing up. Luckily there were three other guys so it didn't take long to set up and pick up but I put away all my decoys wet and muddy. I was going to meet up with some guys this afternoon and hunt those birds today and tomorrow morning but they ended up going home early so I'm just going to go scout them this afternoon and set up in the morning by myself. I'll have to use a decoy sled to haul some totes into the field. Doubt I'll be able to get many decoys out so hopefully I'll be where they want to be and hope for the best. Did pretty well this morning. Had to walk the decoys in a bit still, but only about 150 yards. First flock was probably 150 that came right in and we both doubled. Had a single, a double, a single, and a three pack that came in that we got two out of. Finished with 10. Both of us shot real well for all we had come in. Most groups ignored us even with a nice wind. Five were ross, and five were snows, with one juvie. If we can keep our birds for these two warms days tomorrow and Wednesday, we should have birds till the end of season with another winter storm coming late in the week. spaightlabs, Huskermut, Neck Collar and 2 others like this. Great to hear you finally got into them and wish you success in the next few days! Looks like your snow has pretty well disappeared. I had a buddy scouting the area I hunted Monday on Friday and didn't see a single snow. I went to another area I hunt Saturday morning and also didn't see any. Things came to a screeching halt as I saw probably 100k birds a week ago and they all left within two days basically. Figured there would be a pocket here or there but nothing to speak of. Only 15 days between my first bird and last bird shot. I'm on to turkeys and some walleye now I guess. Huskermut and ajj16 like this. Set a smaller spread than normal this spring, couldn't get the rest due to flooding. I will say though, shot just as many over 20dz FB and floaters as we did over 1200 FB and floaters. Huskermut and nebgoosehunter like this. I put this in the turkey forum but thought I would throw it up here too. So let me start this off by saying I'm not an avid bow hunter by any means. I bought a used bow from a buddy a few years ago to try and get a muley out at our farm but haven't been successful. My dad and I tried one archery hunt for turkeys last year and they were roosted 200 yards off a highway and it was a full moon so we couldn't get set up where we wanted and it just didn't work out. Fast forward to last week, while I was scouting for snow geese I came across a nice group of turkeys with a pile of toms on a landowner I have permission from. I had a buddy roost the birds last night and we slipped in early this morning and set up about 100 yards away. Birds started pitching down before shooting light even and soon we had birds surrounding us gobbling their brains out, but they stayed just far enough away. 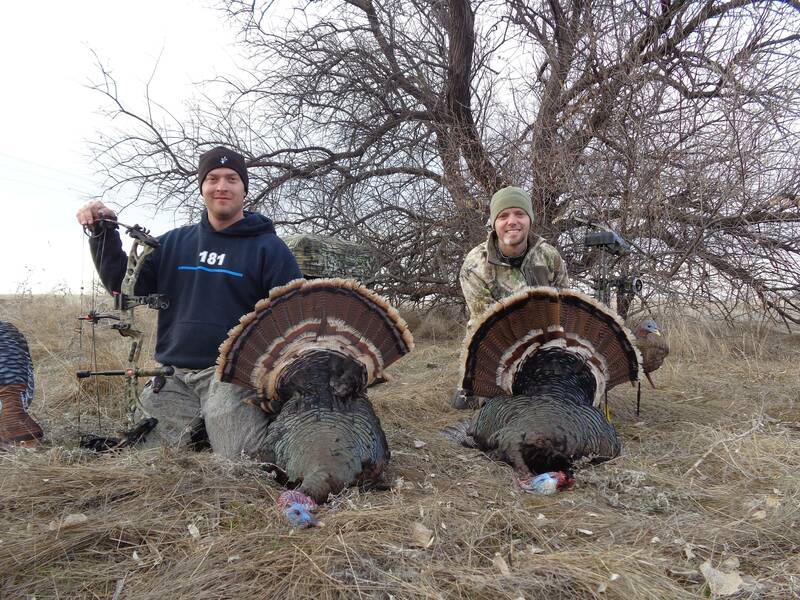 Finally a group of three toms come in perfect and I had the first shot. I don't know if I rushed my shot or what but I must have hit him with a glancing shot as he just kinda walked off and joined the main group looking like he was ok. My buddy shot right after I missed and nailed his bird. The whole flock proceeded to come over and beat up his bird but I just didn't have a shot on any of the toms as they kept moving around and hens were in the way. One determined tom kept after the dead one for almost ten minutes and finally he gave me a window to shoot and I made the most of it. Smoked him right in the vitals and he was dead instantly. I didn't have a lot of confidence after missing my first one so I totally surprised myself and said out loud to my buddy "oh...I drilled him" lol. With all the ducks and geese flying around, and the sounds of spring, and so many close turkeys, it's a memory I won't soon forget. Huskermut, marshmadness402, ajj16 and 4 others like this.